A beautiful and original hand made bodice from a c1850's crinoline gown. The pagoda sleeves are enormous! 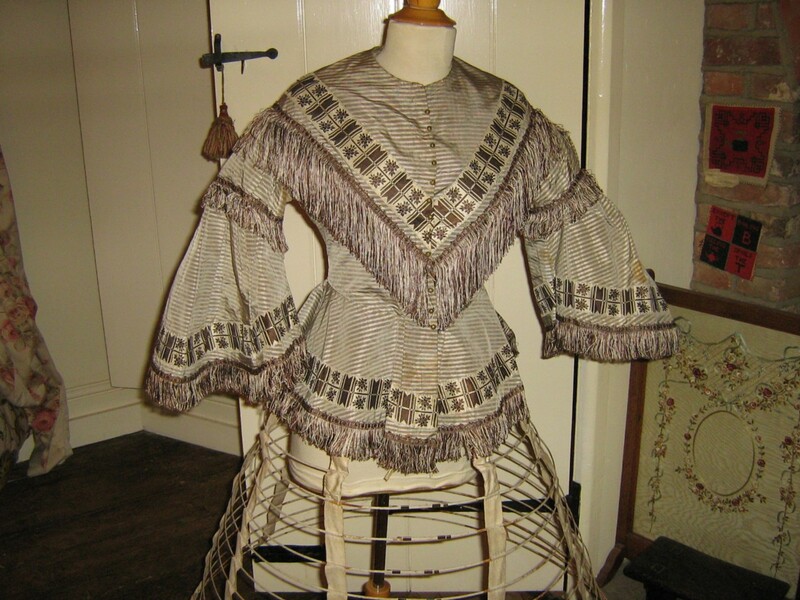 They are also delightfully pretty, with the sleeve upper caps being box pleated loosely, then fringed, before the vast sweep outwards to the very wide bottoms. 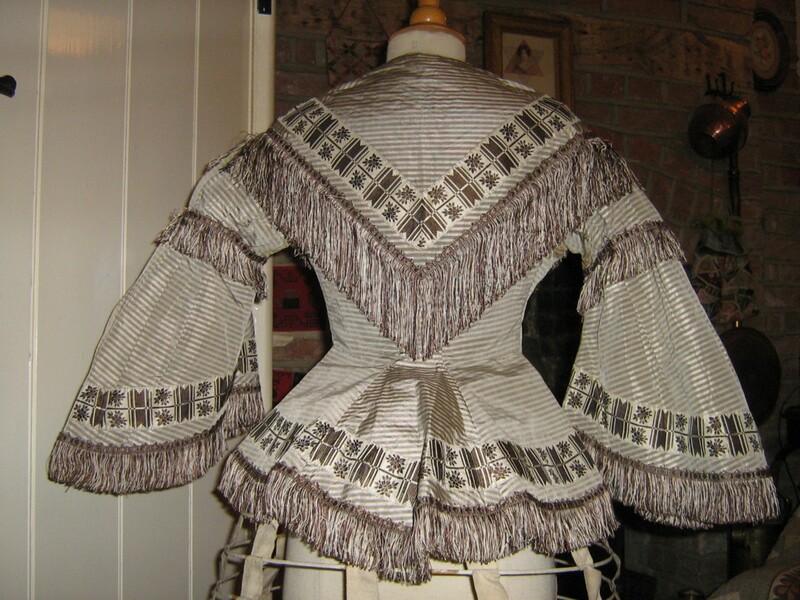 Now, the bodice is made of a lovely thin striped soft grey & white silk, but this only acts as a backdrop to the profuse fringing and the wide ribboned braid which is particularly fine in brown. A perfect little watch pocket sits at the front waist, and this draws the eye to the delightful tiny gold buttons which decorate the front fastening, which is actually hook and eye. Inside is just as nice, with a tie waist inner belt, and glazed cotton lining before a very deep silk hem lining. Lovely. The size of the bodice is perfect on my 33" chest mannequin but the waist is larger, at about 24-5". Very good condition, especially for age. The main issue is mild to moderate discolouration, you will see it far more with my flash camera than in natural light. The worst is to one sleeve. Please don't dry clean it -too precious and old! But the spots may steam out if you know what you are doing. This discolouration is also at the exterior underarms, but it is virtually impossible to see because of the huge sleeves and fringing. I have found no splitting or damage to the silk or lining. One bone needs to be stitched at the top into it's casing - very minor and just as minor, one short length of fringe to the shoulder needs re-stitching in place. Finally, the lady wore many collars with this bodice, as there are a host of tiny pin pricks to the front neck! Add your own collar but try not to move it around to avoid adding to the pin marks! 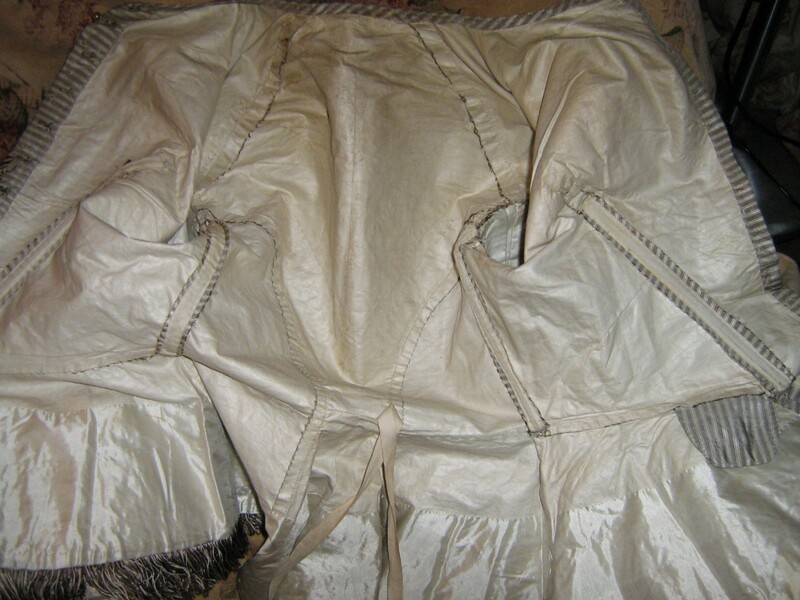 In my opinion, this is a lovely example of a crinoline bodice, finely decorated and excellent for a collector.